The Aero Midnight skin is a dark and beautiful take on the Aero "look". The smooth design makes this skin perfect for anyone looking for a more minimal look, that is easy to work with on a daily basis. Aero Midnight is available free to subscribers of Object Desktop. 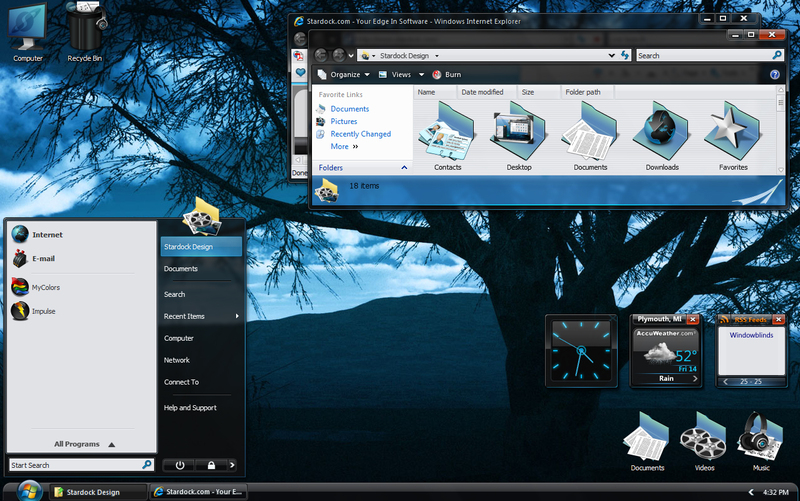 It can be downloaded via Theme Manager, which is included with your Object Desktop subscription. How do I get this through the Theme Manager? I am a subscriber to OD. edit: maybe something is wrong as you can't click on purchase. It says that the "Product is not available". How do I get this through the Theme Manager? Open Theme manager. Then choose "Suites" under the Themes tab. If your OD subscription is current, it should be there. I love this skin. It's something I keep coming back to. Thanks John! Awesome skin. Thanks for the help Mirsguy, I was having trouble finding it myself. Thank Brad, was his idea and his dime. I have to also agree though, one of a few skins I come back to time after time. Now that I've got it loaded... WOW. So clean and usable and it has style. LOVE IT! I want to download and it says its not available... Will it be back? This is my fav one, I just can't use any other skin One of the best skins EVER!!! Shame I don't use Vista anymore, it looks even better over there Infu..credible!!! John you're the best! Can you only get this if you subscribe to Object Desktop? Or you can purchase it as a Master skin here. I am unable to get the windows blind skin for this theme to install and set. I am using theme manager. Every time I clink apply the wallpaper and object install but after a few seconds the skin I am currently am using is re applied. Any suggestions. Edmir - you might want have a look in the forums under Support-Object Desktop-Theme Manager or start a thread there if you don't find anything. ///////// Yet another nice skin vStyler! Wow, she's a beauty. Well done Stardock. I always forget that I have this one and it is a nice skin, but I'm currently rockin Prowler and just can't switch yet. Thanks V!